Activists in Seattle renamed the city’s municipal building as “Comcast’s City Hall” on Nov. 2 with lights during the mayoral campaign. They say Comcast and other telecom companies have derailed plans for a municipal broadband network. 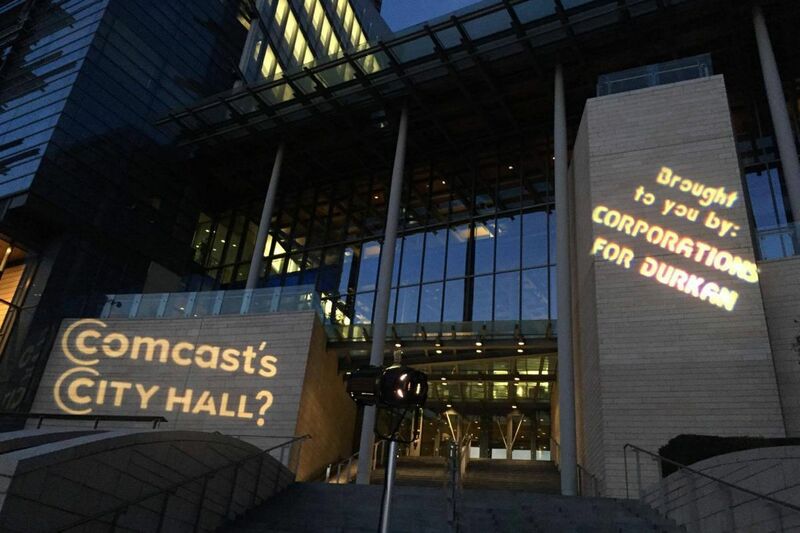 With Tuesday's election to determine Seattle's next mayor nearing, an activist group lit up the outside walls of city hall there on Thursday night with "Comcast City Hall?" Upgrade Seattle's purpose was to bring attention to Comcast Corp.'s influence in local politics and a stalled plan for a city-owned broadband network to compete with Comcast and phone giant CenturyLink. Mayoral candidate Cary Moon supports a municipal network that could offer faster speeds and lower prices, while opponent Jenny Durkan does not support a city-owned internet network, said Devin Glaser, policy and political director at Upgrade Seattle. Local elections in recent years have become referendums on internet services in some parts of the country. And Tuesday's election is no exception, as towns and cities have clamored for 1 gig speeds and sought to calm residents who complain about high prices and bad customer service. Comcast is the nation's largest residential internet service provider, with about 25 million internet customers. Voters in Fort Collins, Colo., will vote Tuesday on changing the city charter to authorize the city to build its own broadband network, the second step in authorizing municipal broadband. In 2015, voters approved a measure exempting Fort Collins from a state law that prohibits municipal broadband networks in the state. If it passes, Fort Collins officials believe, they could advance the municipal broadband network that its supporters say would cost $150 million and halve prices for 1 gigabit per second (Gbps) service to $70 a month from $150, a local official said. "Comcast has pretty much cornered the high-end of the [broadband] market and CenturyLink has the low end because they are relying on DSL technology," Glen Akins, a leader in the Fort Collins Citizens Broadband Committee, said Monday. Boosting internet speeds in Fort Collins to 1 Gbps throughout the city would improve the quality of life, allowing the region to market its "beers, bikes, and broadband," Akins said. Television advertisements opposing the referendum question say Fort Collins government should pay more attention to traffic and public safety rather than concern itself with a municipal broadband network. Last year, 26 communities in Colorado voted on municipal broadband measures and all passed, meaning those municipalities can now explore building their own networks. In total, more than 100 communities in Colorado have voted in favor of measures to bypass the state's law banning municipal networks, according to published reports. Comcast said that the circumstances in each municipality is different as they relate to city-owned networks and that local governments many times enter into the business with unrealistic expectations and positions, leading to taxpayer boondoggles.